Making online transactions has become second nature to us over the past decade. In the early 1990’s buying goods and services online was something very new to us.Some people were skeptical about giving out credit card or banking information, but the process has become much more secure over the years. Making purchases online has become very convenient and has made it easier to shop for things we want. You can shop for just about anything you could imagine without leaving your house. Furthermore, you can compare pricing and organize your online shopping cart very quickly before committing to your final purchase. Many times when we are purchasing items online, we will want to buy accessories or complimentary items to those we are purchasing. For example, when buying a new CD we may also want to buy a pair of headphones or another CD by that same artist. A very handy feature that all checkout pages should include is the option to add more items to your basket. This will allow you to keep the first items you selected for purchase in an area of the webpage that will store them, and then navigate around the website to add more items to your shopping cart. 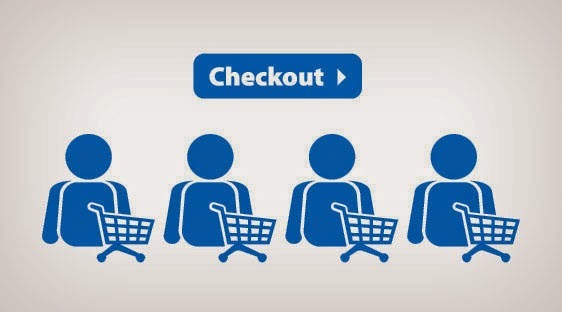 Adding more to your basket is an important feature so that you are not locked into the first items you wanted to buy once you reach the checkout page. A progress bar showing the different stages of the buying process is also very useful to online customers. It will give you an idea of how long the process will take, what type of information will be required and when. This will also allow the customer to keep track of where he or she is at in case you need to come back to it later. This simple tool acts like a table of contents to give you insight into how you will make your purchase. It will add comfort and confidence to the buyer so they do not feel like they are just blindly making a purchase with no end in sight. These are features on a web page that will ask the site visitor to make an action to follow through with the purchase. These may be in the form of a download button, a button to buy an item, or anything requiring the user to take a step toward making a purchase. The more of these buttons that are available, the easier it is for someone to navigate the site. Buyers are not always ready to make a purchase in the immediate moment. It could be aggravating for shoppers to find the items that they want to buy and not be able to save them for a later time or date. If someone is required to restart the process of finding the item he or she wishes to purchase, that person may be less inclined to use your website or service. Saving it for later, is a good way to have a place holder for you to return later in time to make a purchase. This again gives confidence and reassurance in the purchasing process. The more comfortable a buyer is, the better chance you have of allowing them to utilize your website to do so. One last feature that is very common for checkout pages to include is the ability to add and remove items from your shopping list. It is another convenience factor for the buyer, so that they do not have to start over in creating a final list for purchase. Including an edit cart feature will allow your customers to customize their final purchase quickly without having to start from scratch. In the real world, a person would need to take the item physically out of their shopping cart and go search for a new one. When shopping online, these shortcut features make the buying process seamless and easy for people to carry out. Being a successful ecommerce entrepreneur means knowing how to optimize the consumer shopping experience every step of the way, and this goes double for the checkout process. Fortunately, you don’t have to go it alone, there are many ecommerce platforms out there to optimize your patrons’ shopping experience for you. For the best checkout process, I highly recommend visiting www.fastspring.com.